RIO Products has announced the release of a new line series, the Indicator II, which is designed specifically for the ultimate sensitivity in fly control and line mending when fishing heavy indicator rigs. 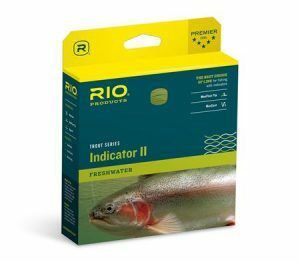 May 1, 2014 (Idaho Falls, Idaho) – RIO Products, industry-leading manufacturer of fly lines, leaders, and tippet material, continues to advance its popular trout series with the new Indicator II fly line. Designed to cast heavy indicator rigs with ease, the Indicator II has an aggressive, short front taper with an extra long head for the ultimate in fly control and mending, while the high-viz, high floating tip helps spot subtle takes. RIO’s DualTone color system makes it simple for anglers to find the ideal casting area of the line, and the front and back welded loops makes rigging quick and simple. The Indicator II also features RIO’s Agent X technology to ensure the line shoots through the guides smoothly and features RIO’s MaxCast and MaxFloat technologies for the very best in performance. For more from RIO on how to fish with an indicator, watch this video. And to help choose the best trout fishing line, please watch this video. RIO is a pioneer in developing fly lines, leaders and tippet material to enhance fly fishing experiences across the globe. Offering premium fly lines for both freshwater and saltwater fishing applications, RIO consistently utilizes field experience and scientific testing to create the best products on the market for anglers. Founded 20 years ago in the mountains of Idaho, RIO continues to develop innovative products, design revolutionary tapers and refine performance-driven fly line technologies. For more information about RIO Products, please visit www.rioproducts.com. Connect with us through Facebook, Twitter, and Vimeo.